Sew! Can! Kenna: Decorations...and other things that sucked up my summer! Decorations...and other things that sucked up my summer! The summer is officially over. I am back to work. The shiny is already wearing off my new students (they are juniors. They aren't very shiny.) and I'm trying to find my routine. That includes blogging! I am going to start blogging again. I miss it. I miss spending time posting the mundane, the cool projects I'm working on and such. But today I'm going to go a little retroactive. I'm going to blog about what ended up taking up a great deal of the first half of my summer, and what I spent the second half of my summer recooperating from! See the dude and I tied the knot this summer. We had a fantastic time too! It turned out to be everything I could ever hope for. However in the mean time I did learn that there is a drastic difference between "getting married" and "a wedding" and while fun, having a wedding is a TON of work. And being the creative, crafty, aestheticly picky sort....it meant I had to do a lot of it myself. First off, we got married outside, at sunset. 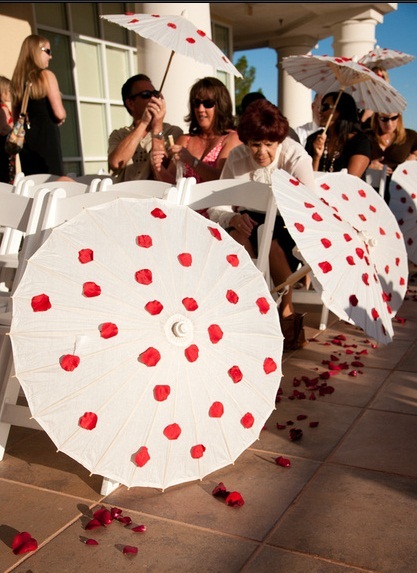 So to protect some of my guests from the sun and to add a really cool decoration I festooned paper parasols with red rose petals. SUPER cute and sooo easy and cheap (literally paper parasols, red silk rose petals and a hot glue gun). 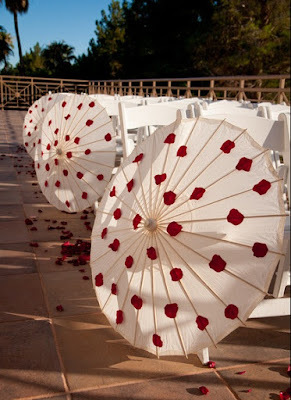 The parasols were from here. We put them up the center isle as a decoration and put a few by the door in a rad damask bucket type thing I found at Home Goods. These are INGENIOUS. I loved them. They were on the tables along with the disposable cameras and gave ideas as to what to photograph. Things like "Best Dancer in Action" and "Cutest couple (not the bride and groom) etc. 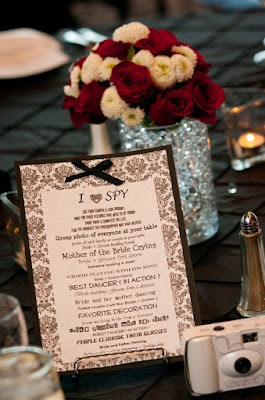 I never know what to take pictures of at weddings and these ensured that we got some amazing photos from the guests. The kissing balls. We had an iron archway that we were married under (hence the black ribbon, you couldn't see it against the black iron. This is the rear view of the kissing ball) and I wanted to decorate it with kissing balls. They. Are. EXPENSIVE. Holy heck. Wholesale the 12" kissing balls were $25!!!! I needed six. That was TOO much to spend on something that was going to be thrown away....and I didn't really love the ones I saw. 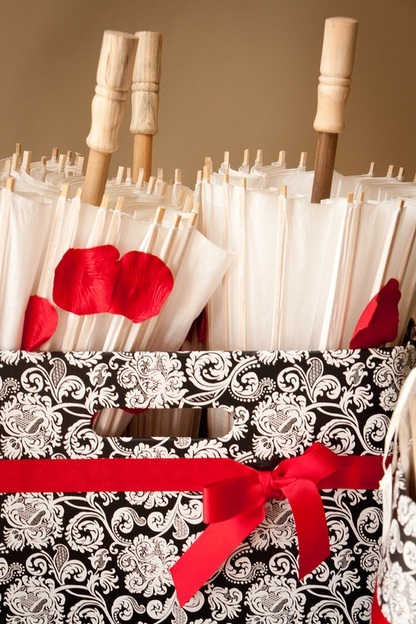 Sooo...with a little crafty ingenuity (and a touch of luck) I came up with these. And I'm going to do a mini, not really a tutorial, tutorial. I did a little bit of stitching around the small rosettes to make them POP a little bit (think a basting stitch) first. 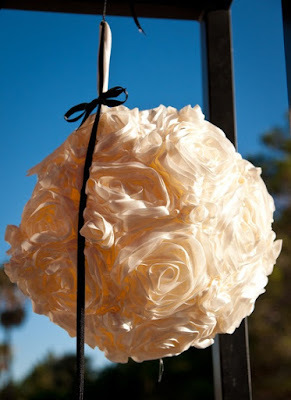 Then I tied the ribbon around the ball so I had a loop to hang it with. Then I started at the top and just glued the fabric down and cut away where I didn't need it. It went remarkably fast (10 min per ball if that) and they turned out better than my wildest dreams. The yellow ball is key...too dark or too bright and the color shines through the fabric (this wouldn't matter if you were using a dark color fabric) but I wanted ivory...and so yellow it was. The reason I didn't use Styrofoam is that they are $20 PER BALL!!! The yellow bouncy balls were $1 a piece at walmart. And lastly....and I think these were the easiest of all. I needed some florals to decorate the bar at the reception, as well as a few of the other random tables we had out. I found these square vases at the dollar tree and just used rose heads (I fluffed them out a bit) and viola! 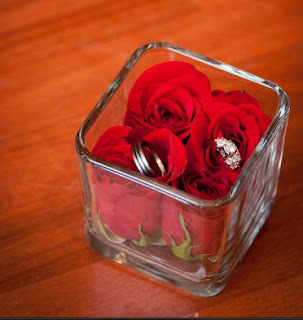 instant cute cheap floral arrangements!